Short range shooting is defined as a distance of 25-100 yards. Although this may not seem like it’s very far, it still covers a bit of ground. Using the best scope for 100 yards or less is actually pretty common when it comes to hunting, sight-seeing, hiking and “backyard” birding. Good viewing requires the greatest precision to see the finest details of your target. 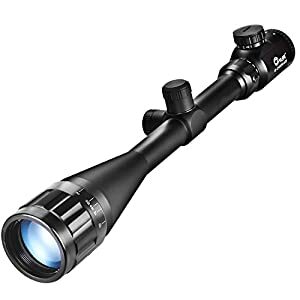 According to Wikipedia, short range scopes are commonly equipped with parallax compensation because errors are more noticeable at distances up to 100 yards. Therefore, the optical devices that are properly called telescopic sights are equipped with the special parallax compensation mechanisms. 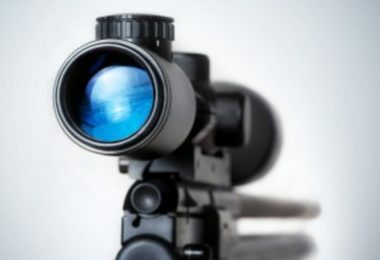 They enable the optics to project the object’s picture at varying distances by making the objective lenses adjustable or by mounting internal lenses in front of the reticles. The models based on the first method are called A/O or AO scopes, the second method is called sidewheel or side focus models. Some scopes have no parallax compensation because their quality is quite good even without these features. The manufacturers adjust the optics at the necessary distance, that is 50 or 100 yards. Thus, the short-range scopes are not the same as long-distance ones. Some features such as magnification, eye relief and weight are similar. Meanwhile, they are less powerful, affordable, lighter and more easily transportable than long range ones. They cost from $30 to $80 depending on adjustment type, ease of use and shooting accuracy. The brand reputation and reliability also matter as riflescopes are designed to serve you for 20 years or more. The scopes can be used with pistols and with rifles. Customers commonly consider the scope’s versatility, reliability and additional features. The application such as sports competition, hunting, traveling or bird watching can be also decisive. Additionally, consider the gun or rifle type, the frequency of use and your experience. So, I’ll highlight 5 best scopes for 100 yards that are durable, reliable and top-quality. The scope is of “mini” type. So, it’s incredibly compact and lightweight. The product meets the highest UTG-brands standards for precision, reliability and accuracy. It is equipped with a reliable, built-in platform that is of TS (True Strength) type. Additionally, it is completely sealed, nitrogen filled that guarantees great water resistance and shockproof properties. Thus, the scope can stand various tough situations, like being kicked, buried or dropped. The scope is equipped with an innovative Mil-Dot reticle that enables range estimation. SWAT illumination is bright and versatile. 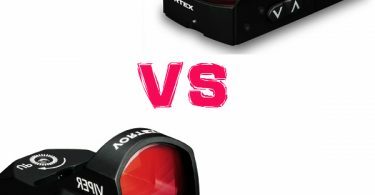 The shooter can choose red or green illumination depending on the weather conditions, the situation and personal preferences. The emerald-coated lens enables Cristal Clear View. The 1-inch tube is designed to allow perfect light transmission. The target turrets are zero lockable, coming with zero reset table. Therefore, the adjustments are precise and consistent. So, it’s the best scope for 100 yards or less. The product comes with limited (the best never rest). 2 Lithium batteries are included for illumination. Additionally, 2 Picatinny, quick-detach (QD) rings and 2 sunshade lens caps (flip-open type) are included. The scope is the most compact and lightweight. It is designed for efficient, close-quarter targeting being suitable for CQB (Close Quarter Battle) environments. It fits multiple firearms types such as SKS, M-16, AR-15, etc. 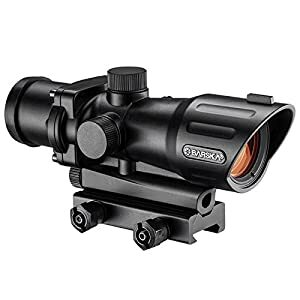 It features unlimited eye relief; red, cross dot reticle, 7-position, adjustable illumination. So, the product is perfect for tactical shooting and various applications such as turkey hunting or sports competitions. It ensures precision aiming, and perfect target acquisition with accuracy. Thus, I recommend the product for any shooting application. The scope is very reasonably priced, but you can’t expect multiple top-quality features for the money. It is very durable and top-quality, made of aircraft aluminum. It is equipped with built-in laser for precise shooting. Illumination is adjustable (5 levels are available). Therefore, the rifle scope is appropriate for use in various lightning conditions. The product comes with the Kernell eyepiece that ensures great field of view and eliminated aberrations. The lenses are dioptric adjustable. Their coating is scratch resistant. 2 mounts are available for easy installation on diverse rail rifles: 20 and 11 mm. The batteries, a lens cover, an Allen key and a cleaning cloth are included in the product package, as well. A video review that is available online is very detailed and informative. 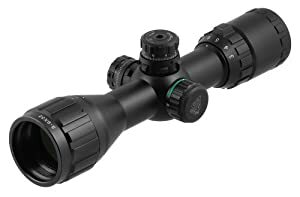 The scope is made of aluminum alloy that is durable (high-strength) and lightweight. It is nitrogen filled and completely sealed. 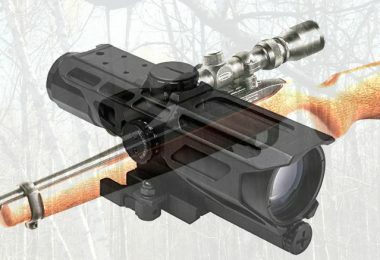 Additionally, the scope is shockproof, rain and fog proof, well-built and easy to mount. The product comes with adjustable red/green 5-level illumination. It is appropriate for any low light conditions and can be comprehensively used at night. Thus, the scope is good and performs well for the price. It is easy to mount and it ensures good clarity and brightness. Meanwhile, the product is recommended for experienced shooters only as the manual is not provided. So, it’s difficult to calibrate and adjust the scope. It is also suitable for occasional shooting, for hunting enthusiasts and entry level hunters. It is good mainly because of low, affordable price. For professional applications other, more powerful and reliable products are necessary. 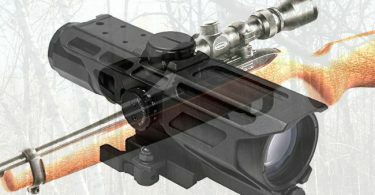 The optics is crystal-clear, multi-coated, scratch-resistant. Additionally, dioptric adjustments are empowered for farsighted and nearsighted shooters. The scope is equipped with Kernell eyepiece that eliminates any image aberrations. A short video commercial is available, as well. some magnification issues and focus problems. The scope comes with 20 mm mount and a battery. The rifle scope is very affordable. However, a good price is not the principal product’s advantage. It is high-performance, durable and top-quality. The lens is multi-layer coated. It comes with an advanced fiber optic sight for accurate and quick acquisition. Light transmission and resolution are also very high. 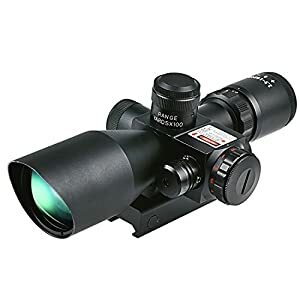 The scope enables accurate shooting; the image is crisp and bright enough for hunting and any other short distance shooting application, even for military use. Magnification is pre-set, adjusted for 100 yards, and it is beneficial for fast scope adjustment, making it user-friendly and convenient. 3 levels of brightness for any color are empowered; so, the scope is perfectly applicable at any weather condition and lighting. 20-mm weaver mount enables fast and easy installation. Additionally, the scope is durable. It is nitrogen filled, fog and recoil resistant. The case is made of top-quality aluminum. Thus, it’s the best optic for 100 yards, especially in comparison with other CVLife scopes. Thus, the scopes I reviewed herewith are lightweight and affordable. They can provide blurred images at long distances. 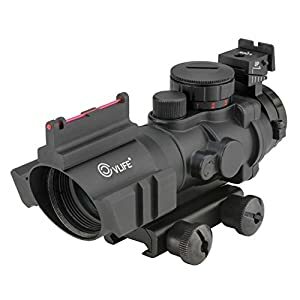 Additionally, the products are not so powerful and do not perform as well as the rifle scopes that are designed and suitable for professional application (military or so). Nevertheless, the scopes are designed for short distance shooting. They are very good for some applications such as hunting, backyard birding or hiking. They come with very good illumination that is suitable for any weather and lighting conditions. They enable a top-quality, clear and high-resolution image at distances up to 100 yards. Therefore, if you are a hunting enthusiast and do not go shooting often, why pay more? 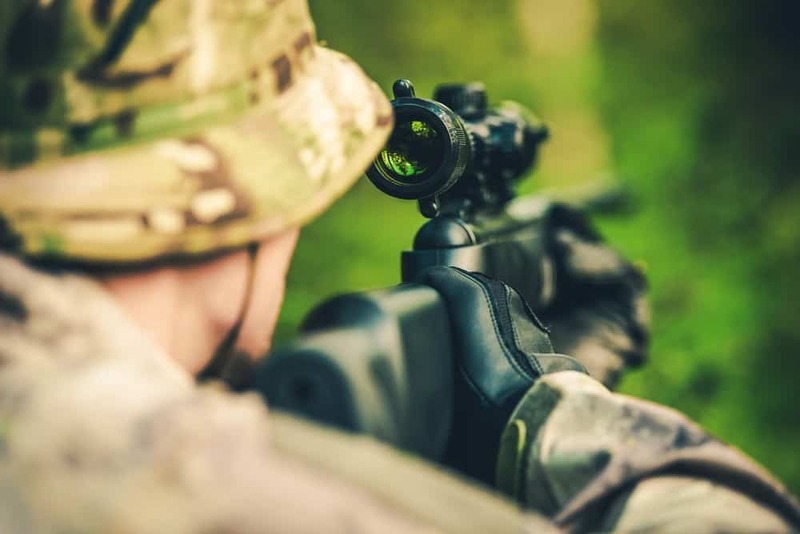 Just think about what type of reticle – Mil Dot or crosshair you prefer, check the optic and your rifle compatibility and select your best scope for 100 yards right now. Meanwhile, any of these rifle scopes are convenient and easy-to-install. It is quite good for occasional use, and it will efficiently serve you during at least 5-10 years.